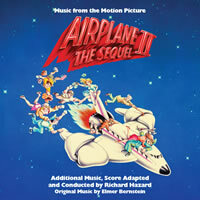 La-La Land Records and Paramount Pictures present the world premiere release of the motion picture score to the 1982 Paramount Pictures feature film comedy AIRPLANE II: THE SEQUEL, starring Robert Hayes, Julie Hagerty, Lloyd Bridges and William Shatner, and directed by Ken Finkleman. Composer Richard Hazard (MISSION: IMPOSSIBLE ’69, MANNIX, NICKELODEON) expertly adapts Elmer Bernstein’s iconic AIRPLANE! score, while also providing his own exciting original music to help launch this sequel’s doomed airliner and its nutty cast of characters into the cosmos! Produced by Dan Goldwasser and mastered by James Nelson from an analog-to-digital transfer and new stereo mix by John Davis, this special release is limited to 1500 units and features exclusive, in-depth liner notes by writer Brian Satterwhite and high-flying art design by Goldwasser. In the years since its initial release, AIRPLANE II: THE SEQUEL has stepped out from the large shadow of its classic forefather to enjoy a cult status all its own. Finally, its time for its lively score to be celebrated as well. So there!